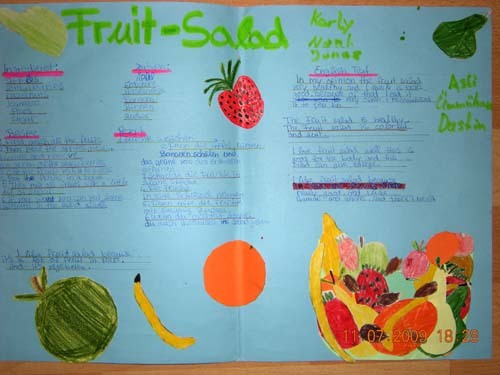 Class 6.3 from the school at Mülheim (Germany) talked about healthy food in their lessons. After that, they decided to prepare a healthy afternoon snack in their classroom. A group of the students did the planning. They decided where to go shopping andhow much food they would have to buy for 32 persons. On a Saturday morning they went shopping. They were able to buy some fruit from a shop which relatives of one of the student rum on their farm in Mülheim. The following Monday, they brought their groceries to school and prepared a resh and healthy snack for the class. They had fruit, vegetables and cheese. After the meal, everbody got a little chocolate and some crisps because if you eat healthily, such things are also permitted. It depends on the amount that you eat. First wash all the fruit. Then peel the apples, pears and bananas and remove the green bits of the strawberries. Cut the fruit into little pieces. and put it into a bowl. Then mix all the fruits with a little bit of sugar. If you want you can put some hazelnuts in the salad as well. One student commented: "In my opinion the fruit salad very healthy and I think it tastes good. Because of that I eat it very often. I recommend it to you, too."